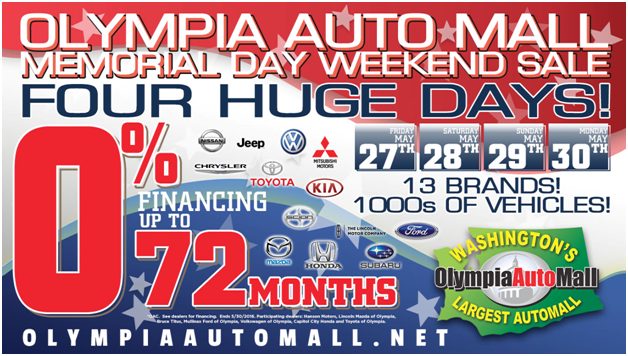 The Olympia Automall is having a Memorial Day sale to remember. Four Huge Days of spectacular sales on 13 brands and over 1000 vehicles!!! Add to that an unbelievable 0% financing for up to 72 months and you have the unforgettable Memorial Day Weekend Sale at the Olympia Auto Mall. Come to Washington’s Largest Auto Mall and bring home your next car during these 4 fantastic sales days. Happy Memorial Day from the Olympia Auto Mall.